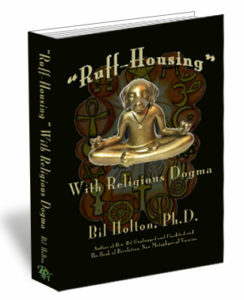 “Ruff-Housing” With Religious Dogma comes out of the doghouse and into your hands! If you’re the kind of person who is more spiritual than religious, you’re ready for this book! Not only a fascinating read – it confirms your choice to take the spiritual path and not the mainstream religious dogmatic route. Rev. 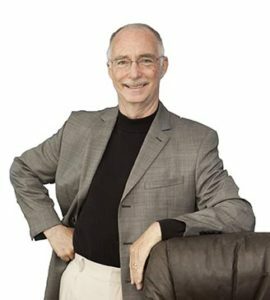 Dr. Bil Holton is a Spiritual Thought Leader, Metaphysician, and prolific author … who loves to question unquestioned answers! He places the “Trojan Horse of Science and MetaSpirituality” squarely in the “Troy of mainstream religion” and upsets people who believe in an external, anthropomorphic, supernatural, tribal ‘god meme in the sky’ … and thrills people who are more spiritual than religious. You consider yourself more spiritual than religious — and you are searching for confirmation that you have chosen the right path for your enrichment and growth. You’ve outgrown the arbitrary beliefs you grew up with, and disagree with the patriarchal bent and exclusivity bias of archaic faith tradition messages. You believe there is a deeper understanding of spiritual texts and beliefs, and yearn for an enriching, enlightening approach to spirituality. Hi! I’m Rev. Dr. Bil Holton and you may want to fasten your seat belts because you’re going to get tons of thought-provoking insights that will not only deepen your spirituality, but concur with the litmus test of your own inner wisdom, accumulated knowledge, education, and openness to compelling, evidence-based content. This book ‘rents the veil’ of mainstream religious dogma, exposes the limitations of literal translations of sacred scripture, and will no doubt push religious fundamentalism’s hot button. In my opinion, it is high time to QUESTION UNQUESTIONED ANSWERS and reinterpret the language of traditional mainstream faith beliefs into a MetaSpiritual understanding that will enrich and enlighten you! Using carefully selected images and dog-related metaphors to add just the right touch of humor to soften the “ruff” edges, Rev. 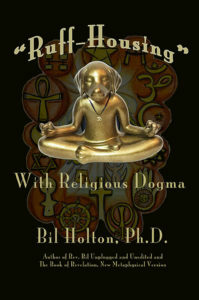 Dr. Bil Holton fearlessly wrestles with religious “dawgma” and transforms it into MetaSpiritual Truth. On topics from Adam and Eve to Zowie, and everything in between, you’ll discover deep interpretations that literally transform you at your heart level. Rev. Bil calls for the dismissal of the concept of a vengeful, amygdala-driven, anthropomorphic god in the sky. This book ‘rents the veil’ of mainstream religious dogma, exposes the limitations of literal translations of sacred scripture, and will no doubt push religious fundamentalism’s hot button. You’re going to get tons of thought-provoking insights that will not only deepen your spirituality, but concur with the litmus test of your own inner wisdom, accumulated knowledge, education, and openness to compelling, evidence-based content. You’re going to get tons of thought-provoking insights that will not only deepen your spirituality, but concur with the litmus test of your own inner wisdom, accumulated knowledge, education, and openness to compelling, evidence-based content! Ready to buy it now? Great decision! deflect the fear-mongering espoused by doomsday evangelists. Fact-shaping involves Feng Shui-ing your thinking. It takes courage to question unquestioned answers and expose dogmatic falsehoods. 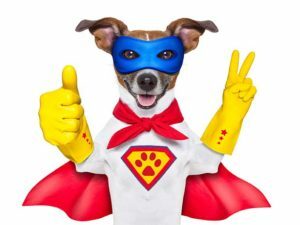 It also takes a little common sense and a sense of humor, so I’ve included ‘dog bytes’ to soften the ‘ruff’ edge of my dogma criticism which I hope you’ll enjoy reading. Recently a student in one of my classes came up to me during break and said: “Rev. Bil, I am so frustrated! I just can’t believe in the God of my childhood any more, and the beliefs of my faith tradition just aren’t working for me! I need something deeper — something real — something that stretches my understanding and helps me get through these tough times!” Sound familiar? I’m hearing it more and more these days! Believe me, I totally understand where you’re coming from. I’ve been there myself. I’ve felt the urge for more meaning and depth in scripture. I, too, was starved for answers that were hard to decipher from religious teachings that didn’t make any sense. You’ve probably heard of the quote that says, “Once your mind has been stretched by a new idea, it will never again return to its original perspective.” It’s true! Once you have found a deeper perspective, a superficial one isn’t good enough any more. This book shares my MetaSpiritual perspective — a combination of spirituality and scientific support. Now I want to be honest with you. This book isn’t for everyone! Don’t bother buying this book if you’re satisfied with literal-only interpretations of scripture. Don’t buy this book if you get upset with a contrarian viewpoint that questions traditional beliefs. This book is for people who are sick of dogma and misinterpretations that lead to bigotry and discrimination in the name of religion. This book is for people who are ready to break free of old traditional beliefs and soar to new heights of spiritual enlightenment! Where did we come from? Is the Adam and Eve story unique to Christianity and what does it really mean? (Did Adam and Eve have belly buttons?) Discover the “bonedoggle” we’ve been fed on pages 11-24. What is the real meaning of Armageddon, and why don’t you need to be afraid? You’ll find out on pages 48-49. Learn how to Defriend Dogma on pages 116-123. Dig into the meaning of EVIL on pages 139-143. What are Filter Bubbles — and how did the concept lead to a Spiritual Practice? Check out page 155. Every Nativity scene shows three wisemen carrying the gifts of gold, frankencense, and myrrh. But what do those three gifts mean from a deeper, MetaSpiritual level? Find out on pages 185-186. What is the Goldilocks Zone, and how do Quantum physicists and spirituality go together? You’ll see on page 187. What dogma exists in Hinduism (pages 204-205)? Why did Job suffer — and what does that “impawsible” story really mean to our enlightenment? The scoop is on pages 227-231.
Who was Mary Magdaline (really) and why is she so important in our Spiritual journey? Find out more on pages 250-254. How can the Neurobiology of Spiritual Practices help you gain the traction you need to become more aligned with your Spiritual Nature? The answer is on pages 267-270. Did you know you have a Spiritual IP Address? Find out what it is on pages 402-405. This is just a taste of the topics that may have frustrated you, confused you, and upset you for years, because all of the traditional faith traditions continue to reinforce beliefs that no longer make sense to you. That’s why I decided to write this book … to integrate over 40 years of metaphysical study, interviews with highly credible spiritual teachers, and my own personal and professional research in the esoteric perspectives of world religions. Your timing in finding this book is perfect, because it took me 40 years to have these MetaSpiritual insights ready for you. Dedicated to open-minded people — outliers who search for truths instead of settling for fiction — who see the need for enlightened thought as an avenue for global transformation and unity — and as a channel for universal love, compassion, ad kindness — so that humankind can put the welfare of all people above the parochialism of tribal religious interests. So what gives me the right to this book? 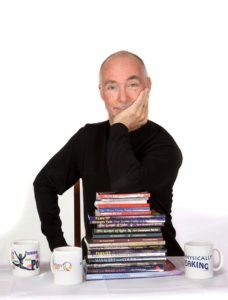 Besides being a dedicated Out-of-the-Box Thinker, I have been writing, speaking, coaching, and publishing for over 40 years, and am proud to have a solid reputation in the field. My ability to bring spiritual truths into down-to-earth clarity help people the world over walk the spiritual path on practical feet. I have written over 37 books on spiritual and self-mastery subjects, and am an ordained (and somewhat rebellious) Unity minister. (By the way, I am also an avid golfer and my beautiful wife, Cher, and I are amateur ballroom dancers.) I am passionate about ensuring our language matches our beliefs, so I’ve been known to create new words when the current lexicon doesn’t cut it! You’ll run into some of my new words when you read this book! The world is awakening to a new, elevated spiritual nature – and to the deeper Truths of Higher Consciousness. You’ll find that MetaSpirituality is all around us — but it is written in a secret code. Once you understand the code, you’ll unlock a whole deeper meaning of sacred scriptures and beliefs of all the world’s faith traditions. 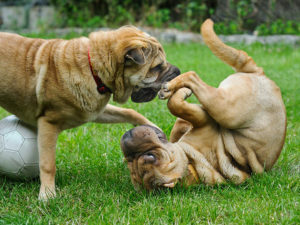 “Ruff-Housing” With Religious Dogma transforms the traditional literal concepts of religion into deeper spiritual meanings to help you deal with the challenges you are facing today. Your interest in “Ruff-Housing” With Religious Dogma proves that you are on the cutting edge of a global spiritual renaissance. Wouldn’t you like to live in a world with those kinds of spiritual foundations? Wouldn’t it be a better place for your children and grandchildren, and their children and grandchildren? We believe being more spiritual than religious is a necessary condition for achieving peace on earth. And your interest in understanding the hidden truths of today’s religious dogmatism means you will be on the growing edge of making a difference instead of the dull edge of mediocrity. 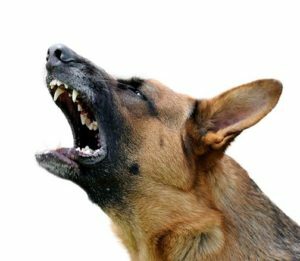 How Can You Use “Ruff-Housing” With Religious Dogma? Use it for Group Classes! 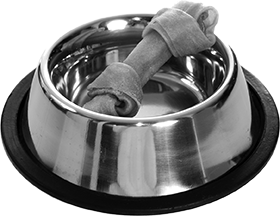 The “Ruff-Housing” With Religious Dogma book stimulates a lot of inspiring and stimulating discussion, as group members stretch their thinking and question their own beliefs in their quest for spiritual enlightenment. Use it as a perfect gift for someone who has chosen to be more spiritual than religious, or is questioning the belief system they grew up with. Here is a sampling of what you will read. Here’s an excerpt from “Ruff-Housing” With Religious Dogma, that takes a look at the concept of Prayer (pages 286-289). Simply put, Christians and Catholics say that prayer is ‘talking to God.’ It isn’t meditation or passive reflection. Prayer is direct supplication to God. It’s the communication of the human soul with the Lord who created the soul. Christians believe prayer is the primary way for believers in Jesus Christ to communicate their emotions and desires to God and to fellowship with Him. The Latin origin of the word ‘prayer’ is precārius, which means ‘obtained by entreaty’ or ‘try to obtain by favor’ or ‘petition for.’ The five common forms of religious prayer are: confession, worship, petitioning, praise, and thanksgiving. Christians pray to God to thank Him and tell Him how much they love Him. They pray to seek divine guidance and to ask for His blessings. The key, they say, to answered prayer is praying in accordance with the will of God and in accordance with His Word. Prayer isn’t about seeking their own will, they say, but seeking to gain favor with the will of their tribal God who knows what’s best for them. The concept of facing in a specific direction exists in other religions. Jews face Jerusalem, more specifically the site of the former Temple of Jerusalem. Muslims face the Kaaba (Black Cube) in Mecca, which they also call the Oibla (another transliteration of Qiblih). Hindu worshippers repeat the names of their favorite gods and goddesses, and repeat mantras. Buddhists don’t pray to a Creator God, but they do have devotional meditation practices which they prefer instead of praying to an external deity. In Japan, Zen Buddhists pray to Amida Buddha, the Buddha of Infinite Light. Practitioners believe that Amida has created a Pure Land in the west, and those who have faith and repeat Amida’s name in prayer will go there. Yet they also believe that Amida is really within them. On the other hand, from a purely MetaSpiritual perspective, prayer isn’t a religious activity we do to a ‘God out there,’ or a ritual we perform to please some sort of external deity like the faith traditions I’ve mentioned above. It’s a deeply interpersonal experience in which we connect with our own innate ‘God’ Essence. When you think about it, the practice of praying to an external, anthropomorphic God “out there” is actually the practice of reinforcing the absence and possibly disinterest or unavailability of that God “out there.” It’s perpetuating the illusion of separation. So, we people who are more spiritual than religious don’t pray to a God ‘out there’ or ‘up there’ separate from them; rather we pray from a consciousness of our oneness with the Omnipresent Universal Consciousness (One Reality, Infinite Isness, Absolute Unitary Beingness, Sacred Unity, etc.) expressing through our Divine nature as us. It’s communion with that part of us which is ‘God’ showing up as us. Affirmative prayer, either silently or vocally, is the kind of prayer Cher and I use. I call it the world’s number one antiperspirant! It’s a spiritual Self-hug. It’s the spiritual mortar that holds all of the other parts of my day together. By connecting with my innate Divine Nature through affirmative prayer, I experience communion with that deeper, more spiritual part of me, which is the presence of the One Reality indivisibilized as me. Affirmative prayer, whether it’s a placebo or not, is effective. It’s spiritual, mental, emotional, physical, and psychic connective tissue. And, in case you’re wondering, any problem too small to pray about is too small to be burdened about. That last statement is one of the best barometers Cher and I use to stay focused and balanced. If you’re the kind of person who prays, you know there’s power in affirmative prayer. If you don’t pray regularly, we recommend adding affirmative prayer to your daily spiritual practices. It’s one of the most effective anti-perspirants we know. It curls fear up like burnt paper. Affirmative prayer is a ‘surge protector.’ It’s one of the surge protectors Cher and I use. The other surge protectors we use to protect us against surges of material appetites and addictions are: meditation, positive affirmations and guided visualizations. We use them to affirm the oneness with our Divine Nature and to bring ourselves consciously closer to our innate divinity. It’s important to us to live a prayer-conditioned life by habitually employing daily doses of affirmative prayer as one of our chief spiritual practices. We enjoy being prayed-up by using positive affirmations—which is what affirmative prayer is when you think about it. It’s a series of positive affirmations that affirm your oneness with the One Reality, the Ground of All Being. And when it comes to effective prayers, there’s a concept I call ‘prayer err’ which means praying with an unforgiving heart and expecting prayer to work. A forgiving heart is a necessary condition for affirmative prayer-lifts to work. Cher and I practice sannyasinic renunciation which is abstaining from overly-consumptive worldly appetites and materialistic cravings in order to advance spiritually. (Sannyasa is a Hindu term for detachment from material life by renouncing worldly thoughts and desires in order to spend the remainder of our lives in spiritual at-one-ment). The dilemma for materialists is their materialism. According to positive psychologists, the failure of materialism to make us happy is that materialistic bents usually don’t increase our happiness quotient beyond the ‘point of purchase.’ Material appetites distract us from more meaningful and joyful aspects of our lives (family relationships, friendships, feelings of well-being, etc.) and cause us to hold unrealistically high expectations of what money and bling can do for us. Oh, and one more thing, Cher and I recommend ‘prayerful parenthesis’ each day. That means bookmarking (sandwiching) each day with affirmative prayers. Create a quiver of positive affirmations and use them as spiritual antiperspirants in the morning and at bedtime each day so you can master the art of living in skin school. and begin a journey to Enlightened Thought! master the art of living as you walk the spiritual path on practical feet! Softcover Version: Order the softcover “real book you hold-in-your-hands”version, and we will have the book in the mail as quickly as we can pack it up for you! While you wait for it, you can take advantage of our special bonuses listed below! Downloadable eBook Version: This eBook is in digital downloadable format, so you get it instantly. You’ll receive the eBook as a pdf file, viewable with the free Adobe Reader or any other pdf viewer. You can get this ebook, along with all the special bonuses listed below, and be reading it five minutes after you order because it will be immediately downloadable in about 60 seconds. It comes in Adobe PDF format which can be read on MACs, PCs, tablets, and phones through the free Adobe Acrobat Reader that’s most likely installed on your computer already. Download This eBook and Be Reading It Instantly! If for any reason you are unsatisfied with this book, no matter which version you purchased, you may return it for a complete refund within 60 days. No questions asked! in order to accelerate your spiritual growth. BONUSES!! Who doesn’t like bonuses? I’ve got Three Great Bonuses for you if you buy from the link on this page! by including some special free bonus gifts as a part of this offer. Why would I do that? Because your spiritual growth and understanding are really important to me! You’ll need to act fast, though! Don’t Wait! The special bonus gifts are included for the first 100 buyers as a way of saying thank you. 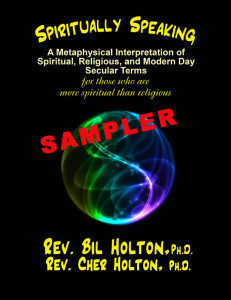 This one-of-a-kind bonus gift is a 56 page sampler from our mega glossary entitled Spiritually Speaking: A Glossary of Spiritual, Religious, and Modern Day Secular Terms For Those Who Are More Spiritual Than Religious. You will find spiritual interpretations and explanations to terms such as: abracadabra-ing, alarm clock, basement, cat nap fraud, chatter bomb, frequent flyer, the Third Coming, garbage disposals, holy ground, junk mail, kundalini, mashup, mental kudzu, negativity bias, optical delusions, parking lots, quicksand, root bound, scuba diving, taxis, text messaging, Tyagaian release, UFOs, voice mail, waterfalls, winged globe, yachts, zip codes, and Ziploc bags. Why? Because the bandwidth of resources used to create this work in progress is broader and more comprehensive than anything else ever attempted in its field. It is a 56-page sampler book, containing a variety of the terms found in the full glossary. And that’s no exaggeration! You’ll see that very clearly when you receive it as part of this offer. Whiplash: what happens when our poor choices catch up to us. You’re not going to believe I’m including this special bonus gift, too! It’s a special White-Light Paper focusing on Prosperity — but not just the standard, run-of-the-mill prosperity teachings that have confused and frustrated people for years. 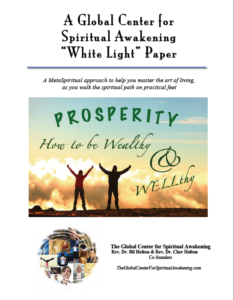 This “White-Light Paper” explodes some common myths that are regularly taught in prosperity classes and replaces them with Prosperity Truths. It also looks at how science is supporting our current understanding about Prosperity Principles, and shares a powerful Prosperity Affirmation and Spiritual Practice. Bonus Gift #3: 30-minute private spiritual mentoring session with me! That’s right! This consultation can be about anything related to your spiritual enrichment and growth. We can discuss a Bible scripture that troubles you … interpret a dream from a MetaSpiritual perspective … create a personal plan for your spiritual practice … You Name It! You have access to me for 30 minutes … absolutely free! Simply call to schedule your time, and we will get it set up! The value of this Bonus Gift is priceless, because it is impossible to measure the value of a great spiritual idea once it is brought to light! Once you have ordered on our secure server, you’ll be taken immediately to a special download page where you can access your free bonuses and the special number to call to schedule your free spiritual mentoring time. And remember: We offer a 100% Guarantee,so there is no risk to you! 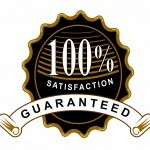 Our Unconditional, No Questions Asked 100% Money-Back Guarantee! I’m affirming already that you will experience a tremendous surge in your enthusiasm for your continued spiritual growth and the growth of your loved ones as you share this metaphysical wealth. Thank you for your interest and I look forward to hearing about your spiritual transformation. Your sending me a testimonial and mentioning the books will help others who are also on the path see how they can use “Ruff-Housing” With Religious Dogma to enrich and enliven their spiritual journeys. P. S. You can expand your spiritual enrichment exponentially by visiting our Spiritual Blog, which is designed to give you a wide range of personal and spiritual development experiences to transform your thinking, feeling, and doing … and help you master the art of living as you walk the spiritual path on practical feet. Congratulations!!! You’ll be in a very select club of MetaSpiritual Practitioners.